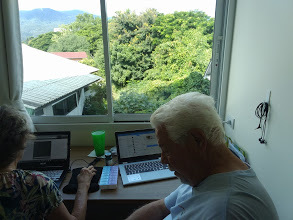 As we write this, we have just a few days left in Chiang Mai and we sit here wondering where the time has gone! What have we done? What should we have done? How can we cram the rest of our plans into a few days – and get ready to leave? We’ve been asked about our daily routine, so we’ll share that with you. Unless we have an early appointment there’s no need for an alarm clock. The resident rooster, or a departing flight from Chiang Mai Airport, does a pretty good job of getting us up! A cup of coffee on the balcony enjoying the view of Doi Suthep Mountain gets us started. Since we have no cooking facilities (other than an electric kettle) our breakfasts usually consist of cereal (which, if it’s imported, is quite expensive) along with fruit which is plentiful, cheap and delicious here in Chiang Mai. Bread (no toaster!) and Peanut Butter is an alternative and we do splurge occasionally and eat an English style breakfast at some of our favorite cafés. Thai breakfasts consist of soup, rice and a stir fry type dish which is not a favorite with Priscilla first thing in the morning! Oh – and also semi cold fried eggs …ugh! Our days are a mixture of work and play. For several years we have been attempting to master online marketing and, while it’s been fun, we haven’t accomplished what we wanted. Chiang Mai is known as the Digital Nomad capital of Southeast Asia, and soon after we arrived we were fortunate to meet an Internet expert who has taken us under his wing and set us on the right path! Boy have we learned a lot! It’s challenging but we love it! So, we’ve spent more time working at our computers than we anticipated. But we’ve still found time for play. 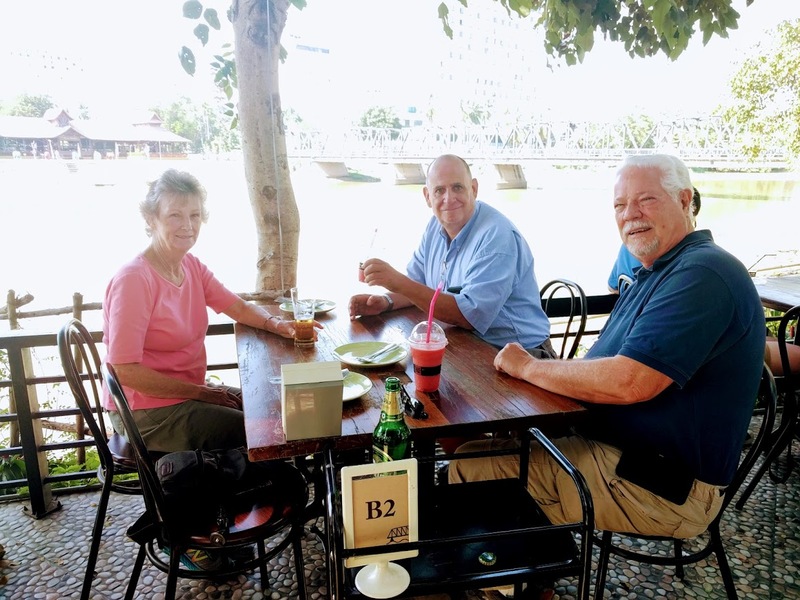 Twice a month we attend a Chiang Mai Expats Club breakfast and have met very interesting people from all over the world; some just visiting and others living here permanently. 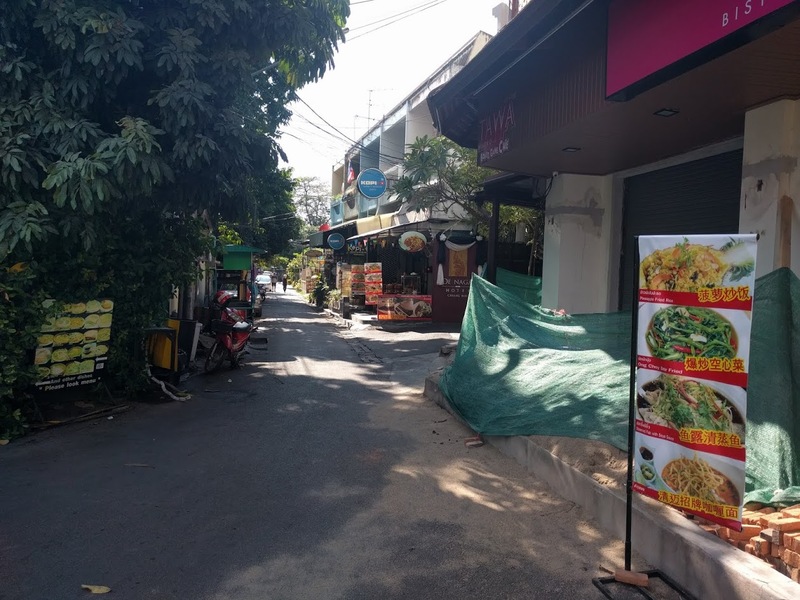 Our previous blogs have recounted our experiences on our unexpected 4 Day tour of Northern Thailand, and we’ve spent time visiting local markets and exploring the Old City here in Chiang Mai. We usually eat both lunch and dinner out and we are fortunate to have a great variety of places to choose from. Within walking distance is Maya Mall that has two food courts as well as numerous restaurants serving different cuisines – American, Japanese, Chinese and, of course, Kentucky Fried Chicken! For a change we buy salad fixings from Rimping Grocery Store and enjoy a home-prepared meal, although salad isn’t exactly Bill’s favorite! Several restaurants offer a delivery service but so far we haven’t used it. We think Chiang Mai has more Coffee Shops than Seattle, Washington. Seriously! For those who just can’t live without it, there are plenty of Starbucks, as well as other international brands such as Dunkin Donuts. But, frankly, we prefer the Thailand chains like Black Canyon and the small independent coffee shops that are dotted all over the city. We also often stop at local coffee stands and street vendors to enjoy an iced Thai coffee! It’s delicious! So what else do we do during the day? Traveling lite means doing laundry every 5 – 7 days which isn’t that much of a problem. The washing machines are on the ground floor of our apartment building and once the clothes are washed we hang them up on the balcony and they are usually dry by the end of the day. We haven’t met anyone here who uses a clothes dryer. We didn’t bring a traveling iron with us which would have been a good idea because some of our clothes are not “drip dry” and don’t look that great despite extra care. We often connect with people over lunch in Maya Mall, at street markets or in coffee shops, and spend time talking about what brought them here and what they’re doing. Time just seems to slip by as we learn about different countries, lifestyles and customs. We find it fascinating. And in the evening? We have a television in our apartment that has numerous Thai stations and just a few foreign stations. If we want to get news, about our only choice is Russian TV! We get most of our news from the Internet, i.e. USA Today as well as CBS through an App on our computers. We occasionally get a copy of The Bangkok Newspaper so we are not completely out of the loop! We also decided to splurge and get Netflix so we can watch a movie when we feel like it. Within easy walking distance, Maya Mall has a very modern movie theatre featuring movies in English and we promised ourselves we’d catch up on movies while we’re here. The complex features an upscale theatre with wide reclining seats, dining, IMAX and 3D movies. Wednesday is “promotion” day with lower admission, however, so far we’ve not seen one movie! We also listen to Sirius radio on our iPad while we work and when we want to relax. It’s a little touch of home which we enjoy. In essence, we spend our time relaxing, eating, working, meeting and making friends, doing a little sightseeing, exploring the city on foot and just enjoying being here! If we can’t walk there, we rely on the Red Buses, known as Songthaews, that charge locals Baht 20 per person but foreigners (farangs) Baht 60 – 100 if they can get away with it! You learn pretty quickly how things work! So you might ask how we get money to pay for meals, sightseeing and other expenses. Well, the days of Travelers Checks are definitely declining! It’s the day of the ATM! So, we go to an ATM, take out as much as we want in Thai Bhat and that’s that. It’s that easy but there’s a catch! Each transaction results in a Bhat 200 ATM fee and your Bank in the US, or wherever, will charge you a currency conversation fee also. So what we did was get an account at a Bank in the US that does not charge a conversion fee and also picks up the ATM fee. Problem solved! Certain credit cards do the same and we highly recommend that you make sure you are not hit with these charges when you travel overseas. They can mount up fast! Many hotels, stores and tour companies take credit cards so all you really need is a credit card (or debit card) and cash from an ATM. Just make sure your credit card company knows you’re traveling and to expect charges from overseas, otherwise your transactions could be refused. We found that if you bring physical dollars with you, you can get a good rate at Exchange offices in Thailand as long as you know which ones to go to. However, we don’t recommend carrying around lots of dollars, euro, etc. in case your wallet is stolen or lost. We hope this gives you an idea as to how easy it is to live in Chiang Mai and many other parts of the world! We’ll continue to give you more insight into how we have lived and enjoyed our time here in Southeast Asia. Stay tuned!